What is a Fotolia credit? Discover our prices and payment methods. Credits are Fotolia’s currency. All image download prices are indicated in credits. When purchased in quantity, credits cost as little as $0.74 each. Credits can be used for 365 days from the date of purchase, so you’ve got plenty of time to select the images you need. The minimum credit purchase is 10 credits. 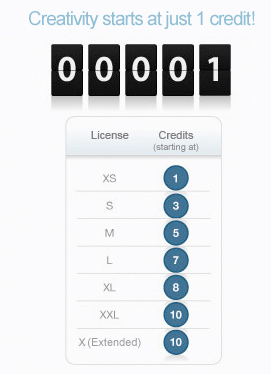 To purchase credits, you'll need an account on Fotolia.com. All receipts will detail the payment method, the number of credits purchased, and date of purchase for each transaction.